SimpleTap™ connection is one of the new features on your Linksys Smart Wi-Fi Account that is bundled with the latest Linksys Smart Wi-Fi Routers (EA6300, EA6400, EA6500 and EA6700). This is one of the easiest ways to connect your Near Field Communication (NFC) compatible smartphone to the Linksys Smart Wi-Fi Router’s 2.4 GHz wireless network. NOTE: NFC is not compatible with the iPhone®. To learn more about the SimpleTap™ feature, click here. Access your Linksys Smart Wi-Fi Account. To do this, launch a web browser (e.g. Internet Explorer) and enter your router’s IP address or "myrouter.local" in the Address bar then press [Enter]. NOTE: To remotely access your Linksys Smart Wi-Fi Account, enter https://www.linksyssmartwifi.com on your web browser instead of the router’s IP address. Log in using your Linksys Smart Wi-Fi Account. Enter your Email Address and Password then click Log in. NOTE: If you still haven’t created, activated or associated an account to your router, click here for instructions. For local access to your Linksys Smart Wi-Fi Account (router is not connected to the Internet), enter your Router Password instead of your login details. For more information on how to do this, click here. 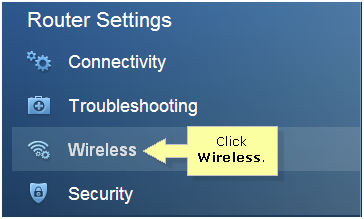 Once the Linksys Smart Wi-Fi Account home page appears, click the Wireless Tool on the left navigation pane under Router Settings. On the Wireless page, click the SimpleTap tab then, use the toggle button to enable (ON) or disable (OFF) this connection feature. Click to save your settings and go back to the home page.